Today we will continue our look behind the scenes and show you part 2 of our “Making of our IMM Booth 2018”. Previously we showed you how we had prepared as much as we could at our company in Gensingen… And now we will take you with us to the fairgrounds: Follow the set-up of the booth, see how all components got assembled, how they are joined to compose the big picture. Our booth at IMM 2018. If you missed this year’s IMM, come and see us next year: IMM 2019 will take place from 14 to 20 January 2019. Long expected, we finally reached the week everybody had been looking for – the week prior to IMM 2018. Our booth builder Ronnie Martin and his team went to Cologne to set up our fancy booth with the help of our Design Team. In our previous blog “Behind the Scenes Part 1” we showed you how we got started with the design of the booth as well as the necessary preparations. But now the serious part started as the set-up would reveal if our design was correct and all the bits and pieces will fit. First of all, we had to take care of the basics – the floor elements needed to be placed and painted. The following day, the crossbars arrived at the fairgrounds together with all the technical equipment and our 120 lights. The lights had been the most important equipment as they were essential for the perfect staging of our furniture. The lights put our furniture into perspective, they emphasize our fabrics, and the structured walls gain even more depth. 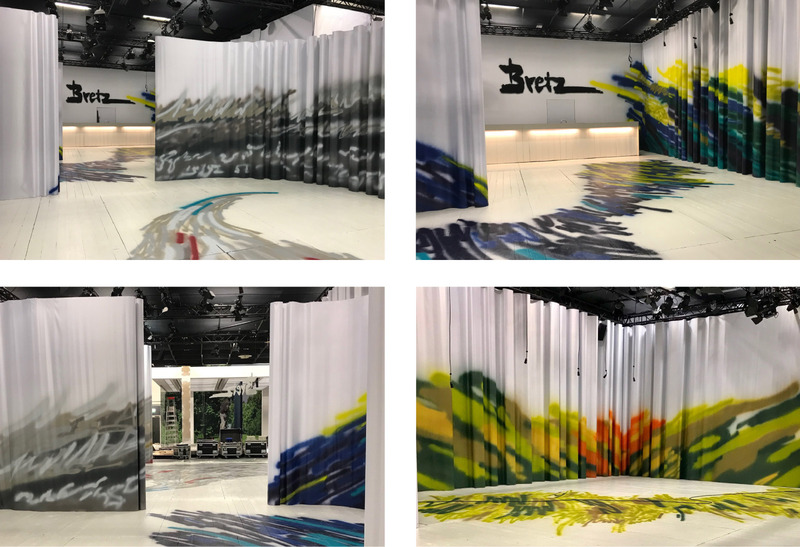 As of day #3, the set-up got really exciting: The construction for hanging the textile fabrics we had built at our company in Gensingen got more or less all assembled and was ready to be playfully draped with our sprayed textiles. Have a look – the slide show reveals fascinating images of the draping. THE PROTECTIVE COVER GETS LIFTED OFF THE FLOOR – THE MOMENT OF TRUTH. THIS IS THE INSTANT WHEN THE BOOTH REVEALS ITS OVERALL EFFECT FOR THE VERY FIRST TIME, EVEN TO US. A REALLY STUNNING EYE-CATCHER, ALTHOUGH THERE IS NO FURNITURE YET. FINALLY, THE FURNITURE MAY MOVE IN AS WELL. 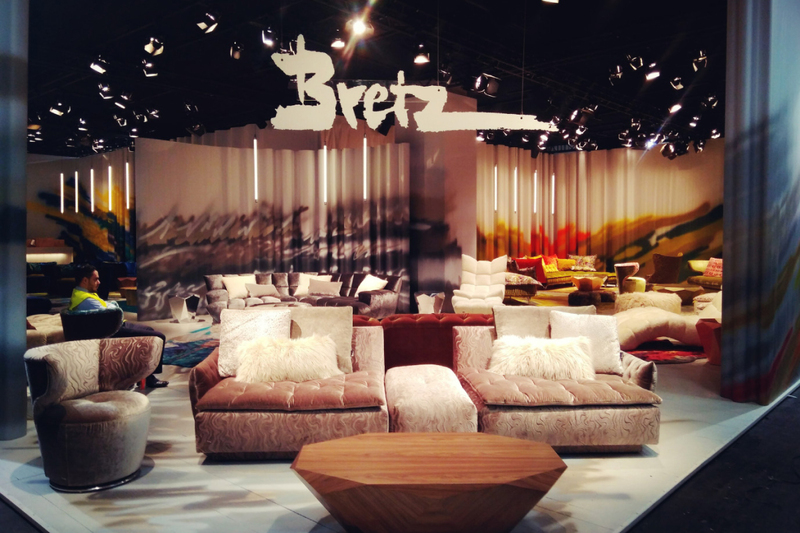 THE SYTHESIS OF FURNITURE AND BOOTH HAS COME TO LIFE. AND WE JUST LOVE IT! 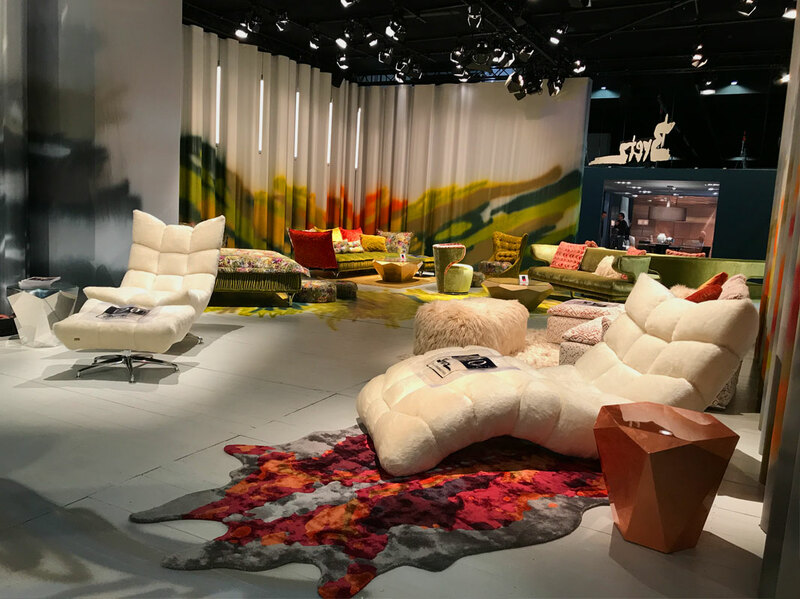 The slider above shows you the fancy design of our IMM 2018 booth from all possible angles. We think it reflects our philosophy and being extraordinarily exceptional in a very special way. The synthesis of furniture and space is also terrific. No matter if it’s OHLINDA, CLOUD 7, or any of our other models: The intensity of the colors, which gets transferred from the furniture onto the walls, creates its very own, powerful dynamics. 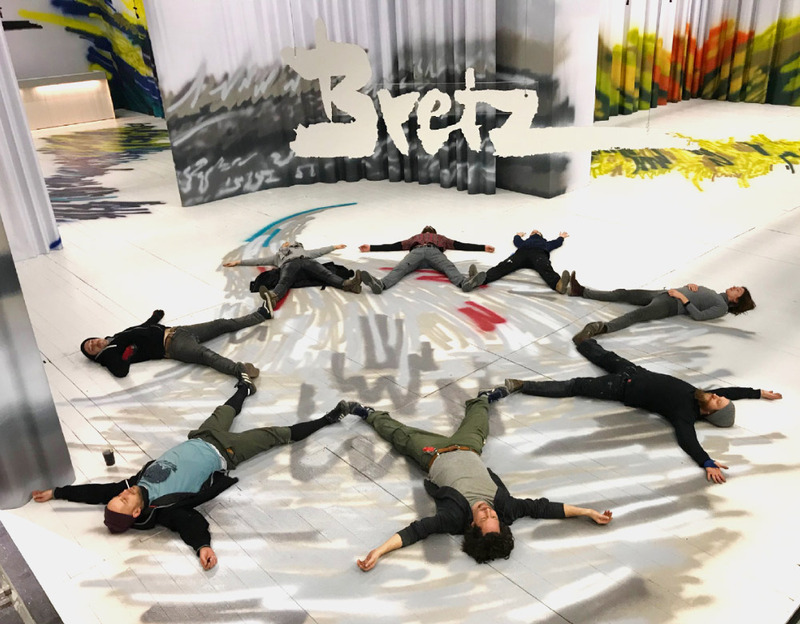 The exhausting but nevertheless cheerful set-up got the team growing together tremendously, and we looked back to that grueling week prior to the opening of IMM 2018 with somehow mixed feelings, laughing and being distressed at the same time. Once again thank you to the crew of Ronnie Martin Objektgestaltung for the great teamwork as well as telling us those various anecdotes. It was only because of that extremely good teamwork that we were able to realize such a fancy booth for our visitors at IMM 2018. And by looking at the booth you could really tell that we have had lots of fun with the design and the entire realization process! IMM 2018 is behind us, but the next IMM is already ahead of us, it will take place from 14 to 20 January 2019. We are already looking forward to seeing you again. Of course, we won’t tell yet what we have in mind for the 2019 booth, but it’s O.K. if you are already curious. Please stay tuned for more information about the upcoming new design and our new models as the date comes closer.